Great children deserve the best nanny available. That is what we believe @ Isabella International Domestic Search Firm. We believe that children should live fun,amazing lives,filled with adventure,learning and a lot of play. We believe children should be safe and well cared for. At Isabella International Domestic Search Firm we focus our talents and abilities on exactly what your child needs per your instructions and present candidates that come ready to qualify for the privilege to care for your children. You have the final say. We simply ensure the right outcome. 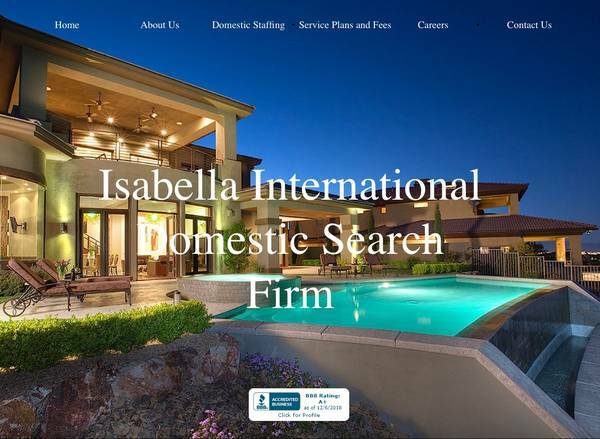 Visit our website @ http://.isabellaheart.com/ or Facebook: http://www.facebook.com/pages/Isabella-International-Domestic-Search-Firm/176402755728047 for all the information. You may also call @ show contact info ext. 1 to speak to a Domestic Placement professional. We would love to get started on finding the right help for your deserving children.